Built in 2002, Ten Bits Ranch (XBR) is on one of the most beautiful locations in the Texas desert. With a shortage of Big Bend lodging and a desire to share the beautiful mountains and dark sky stars, the original proprietors (the Wicks) accepted the massive challenge to build the first off-the-grid lodging in all of Texas. From a tiny solar-powered cabin (the current Jail room), the original owners used inspiration from old western movies to design XBR. The Wicks conceived the original town design on napkins and old menus during happy hours at the La Kiva bar. After recruiting friends in the Terlingua Ghost Town and some long days of construction in the West Texas heat, XBR came to life. They chose our location because it is in one of the most beautiful parts of the Chihuahuan desert wilderness. Yet it sits close to all things Big Bend. And it is in close proximity to the Terlingua Ghost Town. The 500 acres of pristine Ten Bits land make XBR the perfect setting for your Big Bend lodging. After purchasing the property, Cowboy and Sis began a series of small upgrades to XBR. Now we have air conditioning, high-speed satellite internet and HD satellite television. And we have horse boarding available for our guests. As a result of additional solar panels, the power system grew from 2.4kW to 14.4kW. With easy access from XBR, enjoy a day of hiking in the Big Bend National Park, rafting on the Rio Grande or horseback riding at the Lajitas Stables. Then come back to your room at the ranch and relax in a private Big Bend setting. The Ranch property includes craggy desert badlands, long dirt roads, hiking trails, horseback riding trails, and an Indian cave. We also have our very own “Garden of the gods.” As you can tell, we have gorgeous views in all directions. Our remote location makes XBR the perfect place to take photographs, hike, bike, ride your ATV, ride your horse, explore, star gaze or just kick back. Relax and enjoy the peace and quiet of your private piece of Big Bend lodging. Ten Bits Ranch produces 100% of its power and water consumed and is fully independent of the power and water grids. Therefore, XBR is classified as self-sustaining property. To accomplish this, XBR runs on a modern solar power system and uses a quarter mile deep desert water well. We are the first off-the-grid Big Bend lodging in Texas! But don’t worry, the solar power system is hidden with fully integrated construction techniques. The views remain as stunning as ever. Abundant sunshine makes the Big Bend region of Texas a perfect place to use solar energy. 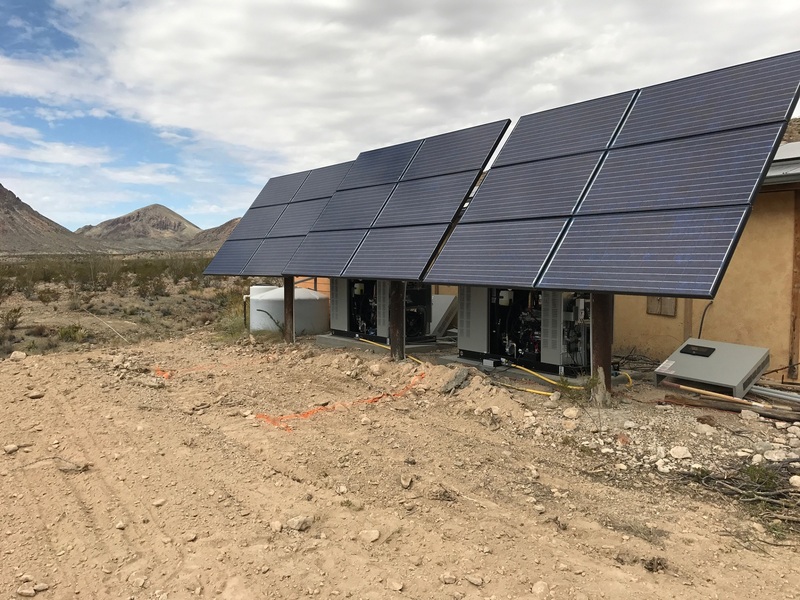 Our solar power system is state-of-the art allowing XBR to offer almost all of the conveniences you would expect without the unsightly power poles or uncontrollable power outages. During your stay, you will not even notice you are off the grid. We welcome you to XBR to become part of the story of this unique Big Bend lodging experience!